I voted for John McCain just one time. I was never enamored with his middle of the road politics disguised as some kind of ‘Maverick’ effort against the inside-the- beltway crowd. After all at the time he was a four term Senator with all the perks and it was hard to buy his whole outsider pitch. He was an inside man asking us to believe he was something else. I preferred several other candidates to McCain both times he sought the Presidency. But in 2008 when he became the Republican nominee I found him to be far better than the alternative. I didn’t think he’d destroy America with the same speed and efficiency of his opponent. In fact I wasn’t sure what kind of President he would be. I was not thrilled with McCain but what choice did I have? I believe McCain and his running mate Alaska Governor Sarah Palin would have been far less painful to the nation and far less destructive to our Republic as a whole. I stand by that decision. Certainly looking back I can say with confidence it was the right choice. What is incredible is that just ten years after the 2008 Presidential Race when then Senator Barack Obama and many of his Democrat cohorts attacked McCain and suggested he played the race card they are now, in the hour of his death, praising him and claiming they loved his ‘independent spirit’. It is another attempt to remake history with outright lies right under our noses. In 2008, Georgia Congressman John Lewis went so far as to compare Senator McCain to former Alabama Governor and segregationist George Wallace who turned a blind eye to a church bombing that killed four little girls in 1963. And when he died Lewis Tweeted McCain was a “warrior of peace” and he will be “deeply missed by people around the world.” Pretty high acclaim for a guy he said was like Wallace I’d say. It makes me question the honesty of any of the race brokers on the left. What is not in question is McCain’s dedication to America. He was a decorated war hero who remained steadfast despite repeated beatings and vicious torture at the hands of the Viet Kong during five and half hellish years as a prisoner of war in the notorious Hanoi Hilton. He was finally released in 1973. His body was broken but his spirit was not and he set his sights on continuing to serve the people of The United States despite the high price he’d already paid. He was first elected to Congress in 1982 and won his Senate seat four years later. He served in that capacity until he died from Glioblastoma, an aggressive form of brain cancer, over the weekend. Although he’d suffered much from war he was still a loud proponent of using American strength and pushed for military force. He was a vocal supporter of the Wars in Iraq and Afghanistan. McCain also advocated for war in places like Iran and other countries we fortunately avoided during his 30 plus years in The Senate. Many of his decisions are worthy of scrutiny before they are worthy of praise. That’s true of anyone in public service for so many years. 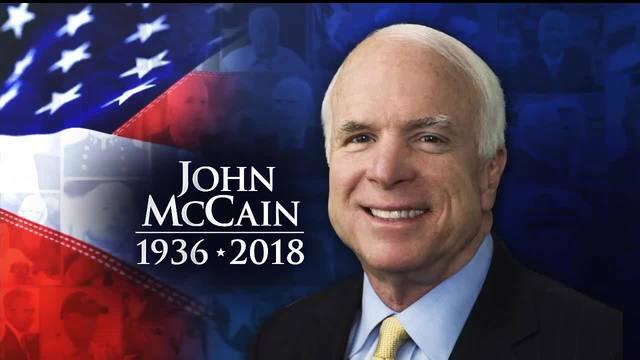 John McCain will be well remembered and was well respected, as he should for the years he dedicated to this nation. His respect was earned on the battlefield and in the halls of Congress. McCain’s loyalty to his country should not be questioned in and of itself but it isn’t a free pass either. Because I will also remember one other notable possibly notorious McCain decision; to reject his own repeated campaign promises to repeal Obamacare. Instead of keeping his word he cast the deciding vote that has kept America under the thumb of a plan that was designed to fail. McCain, the Maverick cast the vote it seems to me out of spite. His regular battles with President Trump were regrettable and he would have been better to avoid the whole mess. Instead of keeping his biggest promise in recent years he rejected the voters of Arizona and hopes of America to get even. Sadly that is part of McCain’s legacy as well. There is a body of work to consider at the end of a colorful and consequential life. McCain did his best and served his nation as he saw fit. The history books will debate whether his decisions were the right ones or the wrong ones. That debate has already begun. For today I will simply tip my hat to a fellow American that at times I agreed with and voted for and other times wished had never run. Such is the nature of politics and a life lived in the public arena for all to see.